I am in love with Aerlit Shuttles. i love the ability to pop out bobbin of one color and pop in another without missing a stitch. 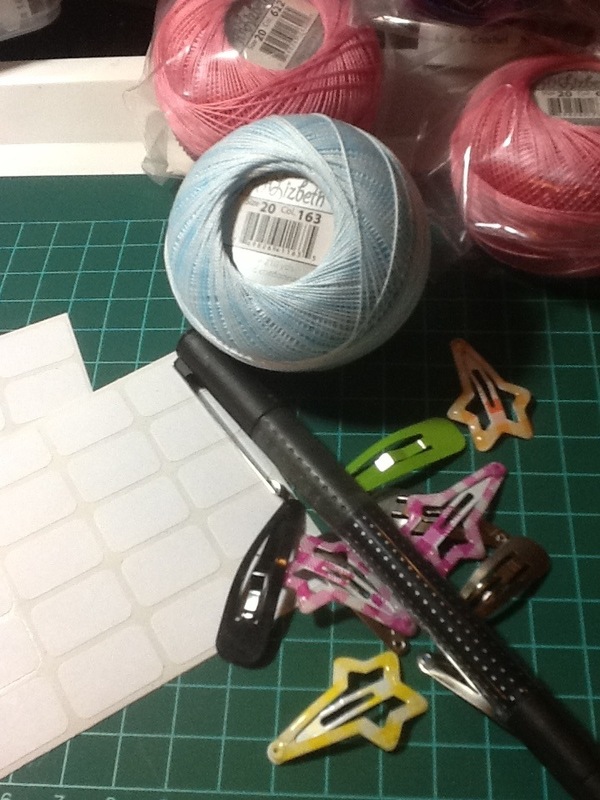 My inner miser also loves the fact that I can save up all those little bits of thread to use in later projects. I quickly got tired of making butterflies in order to clear out the left overs. What do people do with those butterflies anyways? Bueller? Bueller? 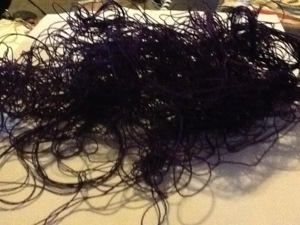 As tatters know, if you put more than 2 pieces of thread within a foot of each other, they will tangle themselves just to give you the joy of separating them. Now imagine 20-25 wound bobbins mingling in my carrier. More often than not, the resulting chaos would resemble the bottom of a teenagers closet more than a proper ladies tatting basket. 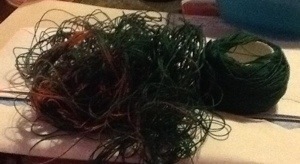 First thing I wanted to get under control was the bobbins unraveling. 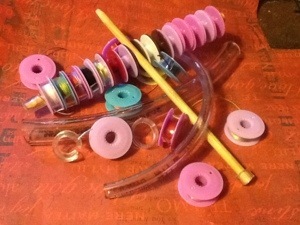 I looked for commercial solutions but the cheapest I could find was $.50 cents a bobbin. Not happening on my budget! 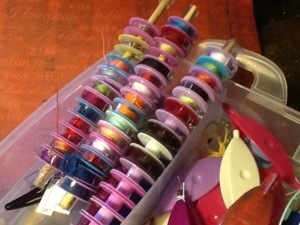 That is money better spent on thread and more bobbins. So, I needed a solution that would cost me less than a nickel a bobbin. Challenge accepted! While looking at the commercial solutions, I saw a couple of hints mentioning rubber tubing. It didn’t seem right so I just clicked right past. But now that I had decided the other ideas were to spendy, I figured I might as well give it a try. It works like a dream. I had to try a few different tubing sizes to get the right one but the whole test cost me less than a dollar. My local hardware store carries the tubing at$.29 a foot, and i still have some left. You will need a nice pair of scissors. Just cut it parallel to the cut end so you have 1/4 inch rings then cut the ring open. Wrap that around the bobbin. No more tangles. 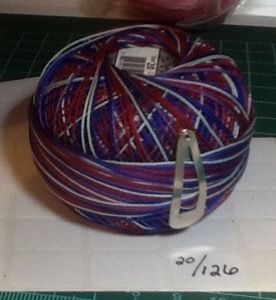 Now that all my bobbins were under control, I wanted to an easy way to see what colors I had on the bobbins. So back to the hardware store I went. I picked up a smaller piece of tubing and a piece of doweling. 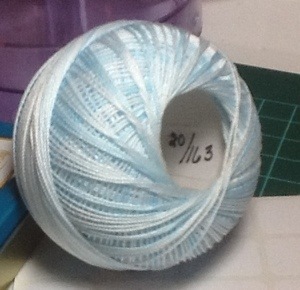 I cut the doweling so it was about 1/2 inch smaller than my tatting carrier. Don’t worry, you don’t need power tools. The doweling it easily cut with a steak knife or a pair of punning shears. Then use a pencil sharpener to angle one end. For each piece of doweling, cut 2 pieces of tubing, 1/4 inch long and 3/4 inch long. it should be a tight fit, but the 1/4 inch piece goes on the flat end as a stopper. This piece will remain in place so you can glue it so you want to. Now load on some bobbins and hold them in place with the longer piece of tubing. push the tubing down past the angled portion till it fit snug. Make as many as you need to hold all your bobbins. I will try to put together a photo tutorial on both these tips in the next few weeks but if you have any questions, let me know in the comments.